Kitchen cabinets and countertops in a wide variety of styles, colors, and designs, at low prices, wait for you at Aqua Kitchen and Bath Design Center in Wayne, NJ. If you live in West Caldwell NJ and looking to remodel your kitchen or bathroom, visit us and find everything you need in one place. Save both your time and your money! We are located near West Caldwell NJ and carry beautiful kitchen cabinets, granite countertops, and quartz countertops. Our team of professional, dedicated designers will personally work with you to design the ideal kitchen or bathroom for your home and lifestyle. With us, problem kitchens or tight budgets don’t exist – we have the experience, knowledge, creativity, and talent to make your renovation project go with ease and enjoyment. Get the kitchen from your dreams at a great price, today. 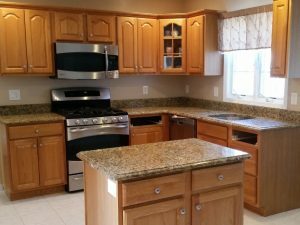 Remodeling a kitchen in West Caldwell NJ will be easy and enjoyable with one place where you can come and find everything you need: best kitchen cabinets, gorgeous granite countertops, and modern quartz countertops, along with a professional advice and free design assistance. Besides great products at low prices, Aqua Kitchen and Bath Design Center has designers with a wealth of experience. Aqua Kitchen and Bath is your one-stop shop for meeting your kitchen and bathroom remodeling needs. We will start off by drafting an innovative and functional design perfect for your kitchen layout. Then we will choose beautiful, durable, and functional products that will serve you many years to come. If you don’t have a contractor, we can recommend you the best ones from the area. The lowest prices are just one of the many conveniences that we offer but they are guaranteed. Bring us a written estimate from any of our competitors, we will beat our competition kitchen cabinet price by 10%. 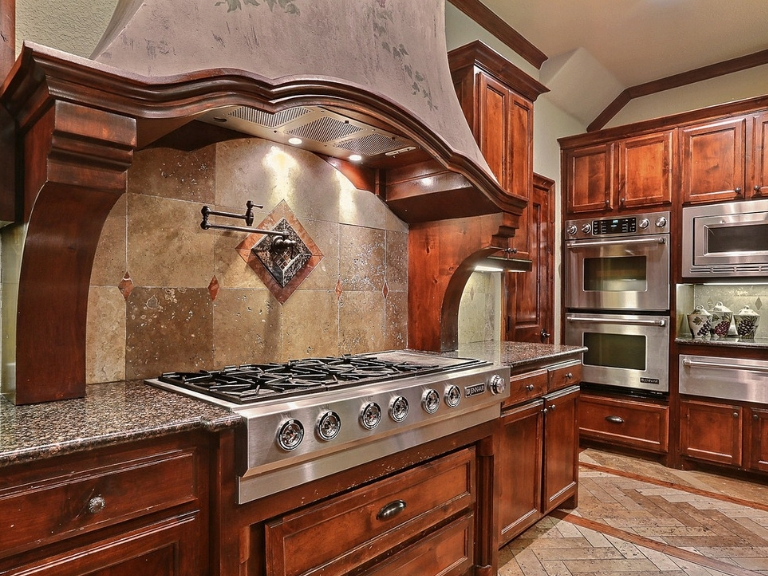 Feel free to browse many kitchen cabinets and kitchen countertop options on our website. All of these are available to you at our large showroom for a close inspection. Check out what our customers say about us. We are proud of the reviews we get from homeowners, designers, builders, and contractors from New Jersey and New York area who worked with us. Take a look at the excellent reviews we get on Google, Facebook, Yelp, and Houzz. Take a short drive to Aqua Kitchen and Bath Design Center and get the kitchen you’ve always dreamed of. Our innovative designs and high-quality products provide solutions for any budget. With us, great quality and high-end look come at reasonable prices. From a simple kitchen renovation project to a difficult kitchen layout on a tight budget – we have the solution to every need. Our kitchen cabinet showroom can equip your kitchen in West Caldwell NJ with exquisite product selection while our designers will provide you with top-notch customer service. Your plan and vision are the most important to us. Check out our Monthly Specials and stop paying more than you have to. 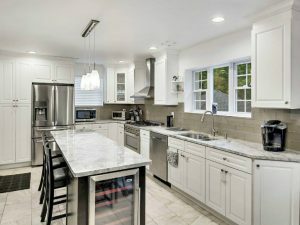 Make the best decision for your West Caldwell NJ kitchen. Our spacious, high-end showroom offers the first-class products and experience. Cozy and bright, it offers a convenient shopping experience for your kitchen remodel. Aqua Kitchen and Bath Design Center showroom is conveniently located near West Caldwell NJ. 12 months no interest financing on kitchen cabinets is just one of the perks waiting for you at our kitchen cabinet showroom. Call us today to make an appointment and see all the products in our extensive showroom. We will answer any questions you may have, help you with measurements, and modify the design until it’s perfect for needs, style, and budget. Contact us today. Head northeast on County Rd 613/Passaic Ave toward Westville Ave and turn right to merge onto US-46 E.
Use the right lane to merge onto NJ-23 N via the ramp to I-80. Keep left to stay on NJ-23 N.
Merge onto Nostrand Ave/Old Newark Pompton Turnpike and use the right lane to take the ramp onto US-202 S.
Turn left onto the ramp. Then turn right. Aqua Kitchen and Bath Design Center will be on the left. 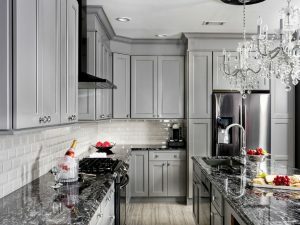 Make your West Caldwell kitchen truly unique, stop by our kitchen cabinet store to find the best kitchen cabinets in NJ. From stock to semi-custom and fully customized options made of wood, with beautiful finishes and sturdy construction, for any budget, your dream kitchen will come true sooner than you thought. With us, you can easily browse, learn, compare, and choose the type of kitchen cabinet, drawer, and style that is the best for your needs, style, and budget. Read our Types of Kitchen Cabinets 101 Guide and then contact our designers to help you design functional and beautiful cooking space you will truly enjoy. Are you looking for the most functional and durable but also stunning quartz countertops for your West Caldwell NJ kitchen? 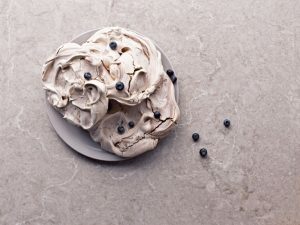 Caesarstone colors will take your breath away. They come with a lifetime guarantee for residential use, have a wide palette of colors, and are very easy to maintain and care for. 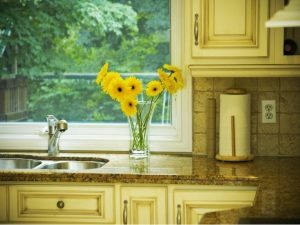 Make your West Caldwell kitchen unique by choosing one-of-a-kind granite countertops. This timeless classic can completely transform your kitchen space or add even more charm and unexpected twist to your cooking space. You will love their durability, ease of maintenance, and stunning looks. Super White Quartzite is a marble-like natural stone that will amaze you with its serene look, ease of maintenance, and exceptional durability. If you love the look of marble but don’t want the high maintenance, choose Super White. Take a look at our project and learn everything you should know about it. Superior durability, amazing ease of maintenance, and natural, organic appearance of Delicatus White granite will mesmerize you. 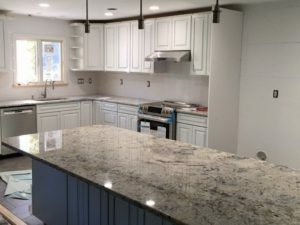 Check out our project Delicatus White Granite Installation in Pomona, NY, and see if this natural stone could be the perfect solution for your West Caldwell kitchen. 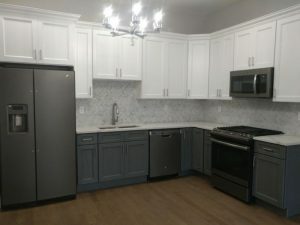 If you love the elegant simplicity of shaker cabinets, neutrality of white and gray, and stunning durability of quartz countertops, you will be very interested to see our Forevermark Cabinets and MSI Quartz Installation in Jersey City project. Check it out and let us know if you would like to start a similar project. Giallo Fioritto is one of the most popular granite choices at our showroom. 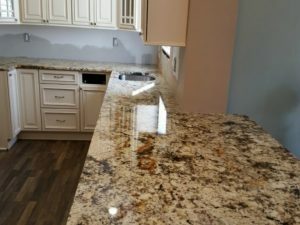 Take a look at our Giallo Fiorito Granite Countertop Installation in Fair Lawn NJ project and consider it for your remodel in West Caldwell NJ. Neutral, with a wealth of details and plethora of colors, this natural stone will amaze you. West Caldwell NJ is a township located in Essex County, New Jersey. Conveniently located close to Manhattan and Newark, West Caldwell is the perfect place to live, raise a family, and enjoy an active, energetic but peaceful life. West Caldwell NJ was ranked by New Jersey Monthly magazine as its 60th best place to live in its “Best Places To Live” in New Jersey 2010 rankings. Bloomfield Avenue is the main route that connects West Caldwell NJ with Newark and New York City. The majority of businesses and locally owned stores is located along this avenue. Apart from stores, two malls, and two public town pools, West Caldwell NJ has many smaller parks and land preserves, such as Francisco Park, Memorial Park, and protected preservation Hatfield Swamp. The township is also known as very peaceful, quiet, and safe. Learn more about West Caldwell NJ on its Wikipedia page. West Caldwell NJ is the perfect place to raise a family, enjoy an award-winning school system, and close proximity of anything that you may need. Take a short drive along Bloomfield Avenue, Caldwell, NJ, to get a feel of this lovely township.